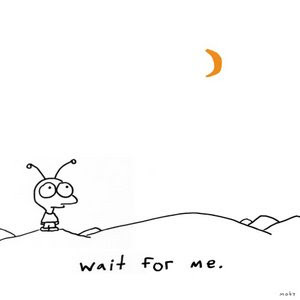 Today, June 30th, Moby (or click here to listen to some of his music) is releasing his latest album Wait for Me. Before I go to sleep tonight, I will be an owner of this album. I've heard all of the songs and can already see that this one is more of the trademark style that got him famous. 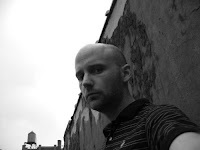 In case you don't know, Moby is an electronica/ambient artist. You may have heard his stuff before, as it is often used in commercials and movies. I first got hooked on him when back in the beginning of high school, I heard a song called "Porcelain" (played in The Beach with Leonardo DiCaprio) on the radio and recorded it on tape (ah, the world before downloading music!). Everytime I heard that song, I felt like I was lying on top of waters, relaxed and alive. During the end of my high school years, he released another album, 18, which was a lot more bluesy and rainy day-ish, but I grew to like that album too. In fact, by the time I graduated high school, I went back and bought some of his other albums in one of those Columbia House-like bargains ($10) package -- Animal Rights, I Like to Score, Everything is Wrong, and Go: the Collected Mixes. As a freshman in college (2004), I heard that he was coming to town to promote his concert DVD release, which also came with a CD called 18 B-Sides, which is currently in my car and contains some of my favorite songs by him. After waiting in line briefly with my old high school friend, I got him to sign some of my album covers! 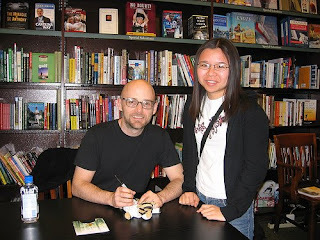 I met Moby another time maybe a year later with two of my sisters when he released another CD (a favorite) called Hotel, which was a vocal soft rock album. That time, he signed the T-shirt of my favorite beanie toy (see picture below) and more album covers! He drew a picture for my little sister in her sketchbook. Tea Time then randomly called into a radio station soon afterward and won us tickets to his album-promoting concert! The concert featured music from all of his albums, particularly Hotel, and even some covers. At the end of the concert, I got to take a pic with him. The most recent (#5) time I saw him was last May performing from his next release, the disco-oriented Last Night, on "Carson Daly's Last Call." That was my first TV taping, and strangely, one of the band members messed up, so they had to do the song again. By this time, I had been dating "The Ukrainian" for less than a month, but he was a good enough sport to come along. No signings this time, but it was good enough to get my Moby urge out for a while. I should add that largely why I have stayed away from meat is because Moby is an advocate vegan. I don't think that all vegetarians/vegans should advocate their practices, because frankly, it annoys people. (Side Note: Of course, I believe that by just setting an example of health, money-saving, and creativity, others can be swayed into those habits as well -- even if occasionally. "The Ukrainian," who is a definite meat-eater, now spends 1 out of every 3 weeks eating vegetarian.) But reading Moby's essays (on his CD covers and online) and my admiration for him in general got me to go vegan for a while. Although veganism ultimately didn't work for me, I definitely noticed a difference in how I felt from day-to-day, in a positive way. So back to Wait for Me. According to his journal, he is likely going to tour in North America (which he normally avoids) for this album. Being that I live near Los Angeles, I am pretty sure a concert will be local to me. I'm already planning on being there with "The Ukrainian" and Tea Time (and any other sisters/friends who may want to join???)! MOBY! Love this write up you did. Moby is so talented. You forgot to mention about going to Teany! Teany-chino! It is a little bit Moby related! Let me know when he is in town! I unfortunately have not kept up with reading his blog. His music's a little jarring for me, but my husband loves him (and occasionally gets told he looks like him...).